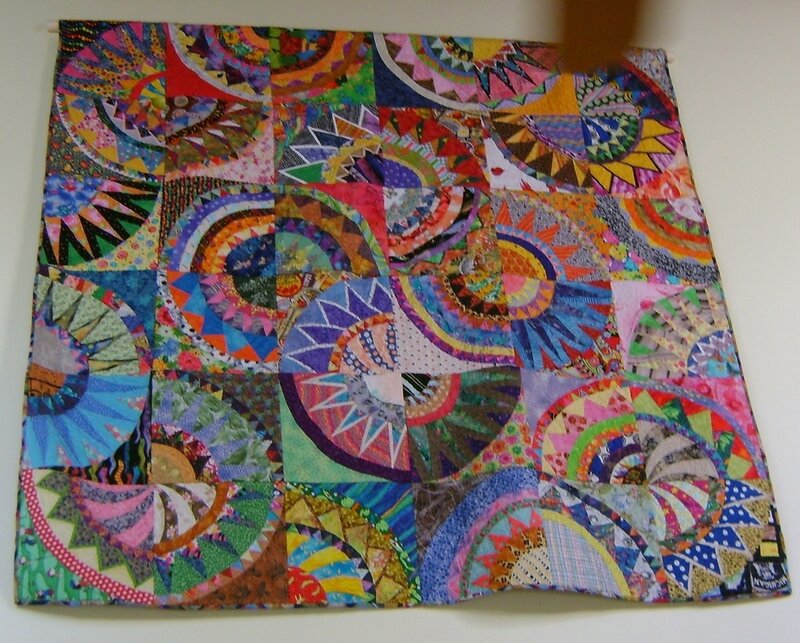 Effervescent is a good word to describe the quilting of Riverwalk Quilt Guild member Nancy Niswander. Exuberant would work well also. Working across a wide array of design and needlework skills, she has brought to her work a range of effective and very appealing results. However, she is quick to discount her artist’s eye and her use of the unexpected, while the viewer is amazed at her creativity. Originally from Garfield Heights, Ohio, Nancy describes her life in Naperville as just another stop along their way as she and her husband travel from London to Anchorage, Alaska and other places in the course of his work. It was in Anchorage that she first encountered quilter Debbie Caffrey, one of her favorites, and became more aware of the art of quilting. Like many of us, she had a mother who sewed magnificently and so Nancy acquired much of her sewing knowledge at home, yet she chuckles and shakes her head as she tells of her passion for gingham checks as a college student, and how she designed and made herself a shirt in every conceivable pattern and color of gingham imaginable and wore them regularly. She still is quick to see designs everywhere, including the grocery store, and to create unique patterns based on them. A dedicated cross-stitcher, she often incorporates those projects into her quilting. Nancy was especially inspired by the RQG program that featured the portrait quilting of Aniko Feher and did portraits of her five children.